BUTCH CASSIDY AND THE SUNDANCE KID, 1969. 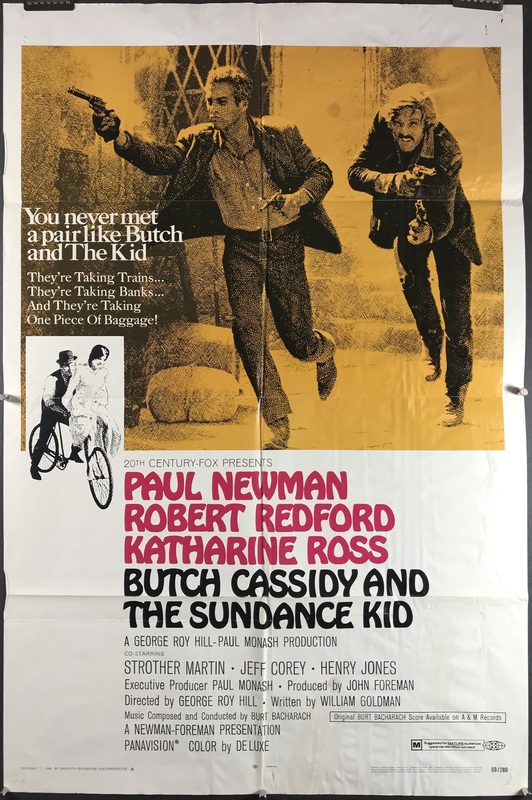 Original 1 Sheet (27 x 41” / 69 x 104 cm) folded Movie Poster starring Paul Newman, Robert Redford, and Katharine Ross. Directed by George Roy Hill, and written by William Goldman. With 4 Oscar wins and 3 other nominations, this is a monumental display of a late ‘60s western with the debonair Paul Newman! Following actual exploits of historical figures, this train robbing duo with legendary on set chemistry embarks on an adventure to escape their pursuers. This folded 1 sheet poster is in very good original C8 condition. There are small pinholes in each corner of the poster, as well as the middle of the bottom edge. There are two places along the left-hand side of the poster where the paper has been folded over, and there is wrinkling throughout the poster, which could be taken care of during the linen backing process. Linen Backing is available for an additional $80 upon request or by adding the service to your cart below. This would produce a flat, backed poster that’s ready to display! We linen back and frame all of our posters IN HOUSE at our studio in Katy, TX!